Betty Lee Tucker. Feb. 9, 1925. This picture showed up this last Christmas '09. It depicts my Mom and my Dad in late 1944-45 just as the great WWII was drawing to a close. My Dad had come in to San Pedro on his last ship, the S.S. Mission San Diego, and had taken leave to visit my Mom, living on Alexandria Street in Hollywood California. Lt. jg. 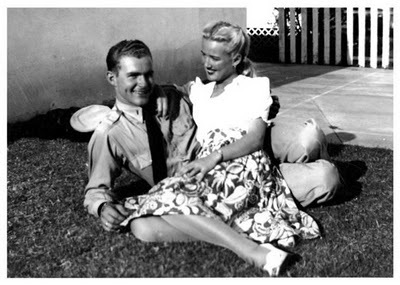 Jimmy Stein was 22, Betty was 20 at the time of this photo. He'd been at sea for 6 months straight, returning from the war in the Indian Ocean, Persian Gulf, and Madagascar. She'd been doing the best she could to cope with the loss of her brother, Bill Tucker, and Fiancee' Bob Ketron. Both were best of friends, both pilots, both killed in flying accidents twenty days apart. During the war, Betty lost 7 close guy friends, all pilots. Betty was a tough catch. Much sought after for dating; she was always 'booked' when my Dad came into port. I think this was the one date he'd reserved 6 months in advance to get. Little did they know then they would start and raise a family of five boys, and a monkey! Who would have known they'd be married for almost 64 years now! They shot us all from the same bow, and me; the youngest boy? They have supported me to follow my bliss as an artist. I put them through hell (with all my accidents) while I was growing up. They put me through college in order to refine my artistic vision and skills. I do pay homage to both my parents for the genetic lineage they've given me. The lineage of unlimited possibility. Tags: 2K10 Painting for a Purpose.